In many cases, jobs in private service are more than just jobs, they are a lifestyle – especially when it comes to live-in positions. Is a live-in job in private service for you? Or are you better off living-out? It is important to consider several aspects of both types of positions when choosing whether to apply for or accept a live-in or live-out position in private service. 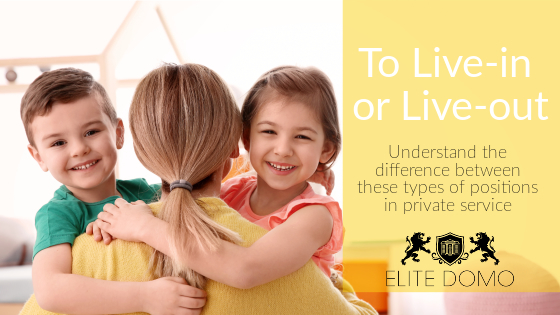 Some of the most popular live-in positions in private service are Nannies and Housekeepers but there is always the possibility of any position in private service being a live-in position. When considering a live-in position, it is important to clarify if the position is a live-in full-time position that includes accommodations and full-board—meaning you will be living there 7 days a week and it will be your primary residence or, if you will be able to go home on days off. Does a live-in position make sense for your lifestyle? Do you have a significant other? Children? Pets? Or family that will require you to travel to visit? These are all considerations that should be at the front-of-mind when deciding to apply for or accept a live-in position. Something that is important to note is that your accommodations will be a taxable benefit if you are not paying rent. Some job offers will establish its value and add this extra deduction for the accommodations, but it is important to review your job offer to ensure that you will not have surprise taxes to pay at the end of the year. We have conducted a short interview with Michelle R., an experienced live-in nanny with over 10 years of experience. Michelle is currently a nanny to one toddler and has been with her current family for 20 months. Michelle says that some of the benefits of being a live-in nanny are the ability to save more money and getting to work is quick and easy. From her experience as a nanny, she has noticed that for a family on the go, having a live-in nanny makes life much simpler for everyone. According to Michelle, one of the challenges of being a live-in staff member is that it is difficult to get away and have a true break because you still see your employers and co-staff on your days off. Even with extremely private quarters, it becomes nearly impossible to truly separate yourself from everything. Review your letter of employment. Make sure that you are ok with the expectations that the employer has for you. i.e. number of hours/week, overtime pay, vacation. Ask questions! Before signing a letter of employment ask as many questions as you need to feel comfortable accepting the offer. Create a social life. Living-in can be tiring especially if you are seeing your colleagues and employers on your days off. Ask about the visitor policy. Discuss any issues as they arise, open-lines of communication are key to a successful relationship between staff and employer.